In Pembroke Pines, Precast Concrete Scuppers are vital to preventing ponding water on flat and built-up roofs or decks. They can be both decorative and functional, especially when you choose a custom-design from the friendly professionals at Atlantic Coast Precast. Since 1965, our team has worked closely with industry professionals including engineers, architects, designers, and contractors alike. Call for your FREE estimate to get your FREE quote. Smart rainwater management begins with precast scuppers poured in our factory nearby and delivered to your site for a speedy, flawless installation. The wrong placement or positioning of your Pembroke Pines precast concrete scuppers can be disastrous, which is why our team makes sure to install your scuppers perfectly with a trusted, weather-resistant seal. We can even produce a matching downspout splash guard to finish channeling water away. 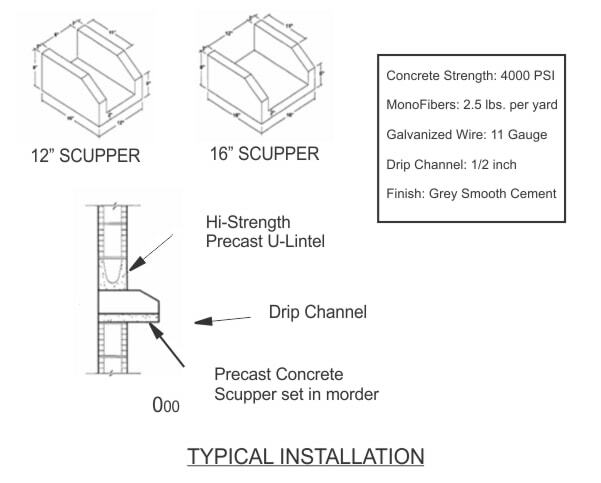 For residential, commercial, and industrial properties in Pembroke Pines, precast concrete scuppers will prevent ponding water by allowing rainwater to exit through outlets. They come in a variety of sizes from 8 inches to 18 feet, with custom designs and a handsome, smooth, grey cement finish that will prevent rotting wood from compromising the structural integrity of your foundation. Begin designing custom precast scuppers with our team, today.